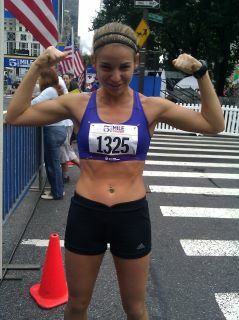 This past weekend I ran two races in NYC – the 5th Avenue 1-Miler, and the ING Marathon Tune-Up 18 Miler. Needless to say, my legs are getting a bit of a break today, which I think they deserve. Somehow, on a weekend with the weather prediction of rain all weekend, I ended up running both races with entirely clear skies – though it was muggy thanks to the lingering humidity. 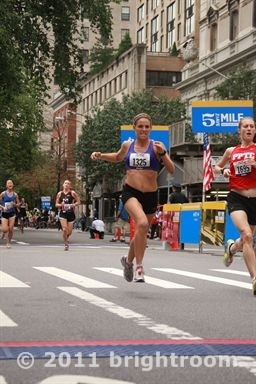 The 5th Avenue 1 Miler was on Saturday morning, and was the shortest race of my life! I didn’t know what to expect, so I came up with the strategy of starting off at my 5K pace, pushing on the up-hill portion, and then using the down-hill on the second half of the race to pick up speed. This strategy worked pretty well, as my biggest fear was going out too fast and completely burning out. While my legs felt like lead for the first quarter-mile (they are NOT used to sprinting out of the gate! ), I ran a 5:46 mile, placing me in 22nd out of my age group and 68th out of the 2072 females who raced! I was really happy with the ability I had to sprint at the end, as I honestly didn’t know how to predict when to push without burning out. I finished strong, and was super happy to see some familiar faces near the finish line – including Chris and Ben. The following day, I rolled out of bed at 5am to run the ING Marathon Tune-Up 18 Mile Race, a gruesome course of three laps in Central Park. Gruesome, because that meant THREE times up the Harlem Hills and Cat Hill, and the humidity had not dropped one bit. My goal for this race was different from most – to focus on pacing, to not burn out, and to use this last of my required NYRR races as my long run. I promised myself that staying healthy and listening to my body would take priority over the race instinct I usually listen to. I ran entirely even splits, which was fantastic as fatigue usually means most runners never run even splits! I finished strong, feeling no injury, still in control of my form, and happy! I finished in 24th place out of the 1,819 ladies, and 7th in my age group, running 7:41 miles, and a final time of 2:18:10. Oh, and I actually jogged 2 miles BEFORE the race even began, thanks to the MTA service on early weekends. 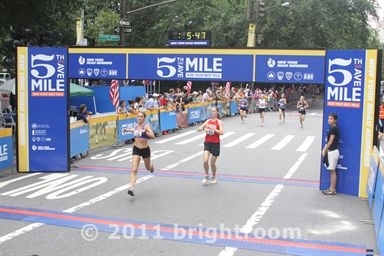 As my NYRR races for 2011 come to a close, I am left with memories from 9 amazing races! However I am still not done for 2011 – I am running a 5K in Philly on October 9th, and the Philadelphia Marathon on November 20th. Therefore, the next few weeks will be focused on training, not racing. Truth be told, the 3 races within 7 days has been a lot, and I need to focus on rest and staying healthy. ~ by Elizabeth on September 26, 2011.